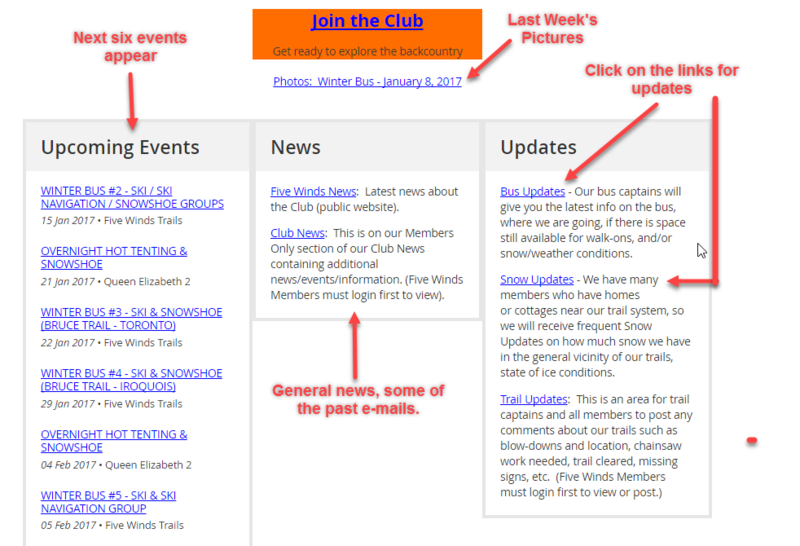 Members should login and go to the Club News site for more info on what's going on with the club. We will be having snowshoes every week on the bus along with our ski bus dates. Winter bus starts January 6th, 2019, and runs each week until the end of March. Please REGISTER by November 8, 2018 so we can estimate how many people we should expect. Snow has consolidated a bit to form a base with lots of new snow on top. Trail skiing with really good conditions. Although we're experiencing this cold snap, many lakes are still open or unsafe as the snow acts as an insulating layer, so there is still a possibility to break through the ice. Marshes may/may not be slushy, as well as the possibility to break through. It's time to get your day pack, and ski/snowshoe equipment organized for the Winter Season. REMEMBER: We are out all day. There areno chalets or warming huts, just the great outdoors, so you need to be prepared in carrying extra clothing and essentials in your backpack. We are not the "lycra and fanny pack" crowd. There will be both a ski and snowshoe option that you can choose. Do we have snow? Where can I find this Information? Information can all be found on the web site. And yes, we do have snow, currently snowing! Please REGISTER by January 2, 2017 so we can estimate how many people we should expect. Fill out the Form > Next > Confirm. You will receive a confirming e-mail back. If you need to cancel, please re-register, and select Cancel my Registration. 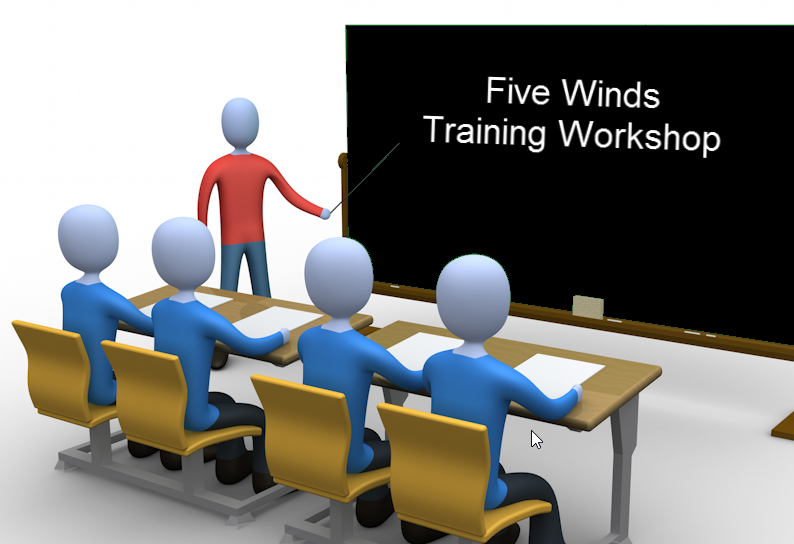 Just in time for our ski/snowshoe season start, we urge all Five Winds tour leaders to attend this safety training session. We also invite all other club members as we each play a role in ensuring safety during our ski and snowshoe days together. 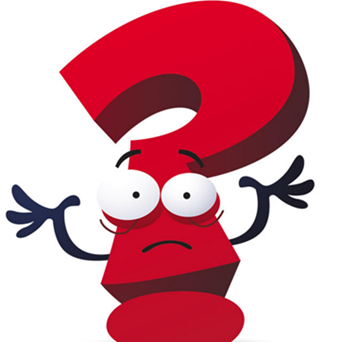 When and why incident and accident reports assist in safety. As this will be a short, information-packed session, we urge you to eat before you come or bring snacks with you. 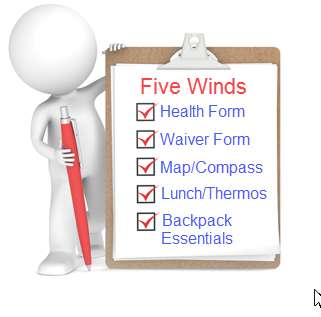 Bring your Five Winds Map. It's that time of year to get your daypack, and ski/snowshoe equipment organized for the Upcoming Winter Season. Short Video: How to Reserve or Cancel your Registration Online. Our preference is that you book online rather than phone. Phone messages can be difficult to hear and important information may be missing. It will make it easier for our Bus Organizers if you book online as the information will be stored in a database, and a bus report can easily be run each week.